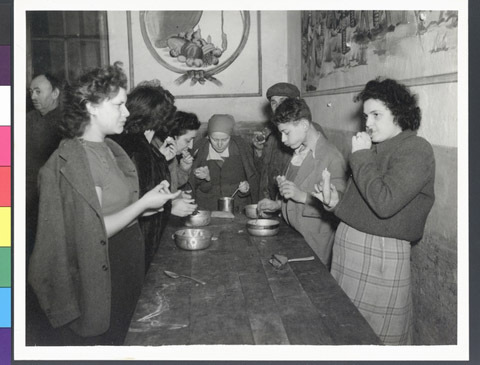 JDC - Archives : Jewish DPs standing to eat in the communal dining room in the Chiari Camp, due to cramped quarters. Title Jewish DPs standing to eat in the communal dining room in the Chiari Camp, due to cramped quarters. Description Space is scarce in the mess hall of the Chiari DP camp near Milan, operated by the JDC, so these Jewish DP's have to stand to eat. The camp, a former barracks for the Italian fascist black shirts was built to house 400, but contains 1600 refugees.